Welcome to Lucky Mansion. Again. You and your associates are treacherous villains, each secretly bent on killing a despicable old man. But he's not called "Doctor Lucky" for nothing. Get Lucky is a simple, light-hearted card game about murdering an old man in his house. It's based on the classic Cheapass board game, Kill Doctor Lucky. 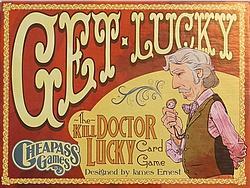 The box contains everything you need: 72 cards, rules, and a pawn to represent Doctor Lucky.